Chairperson, Arya College of Engg. & I.T. SMT. Madhu Malti Agarwal, holds an honorary and advisory position & recognition for the establishment of the entire empire. She is a motivational tool for the whole gamut of faculties, Staff & Students of the Arya College of Engg. & I.T. and sets in the right zeal to perform and face the ever increasing Challenges of the Industry. In doing so, she has set an example for other Indian women to follow. 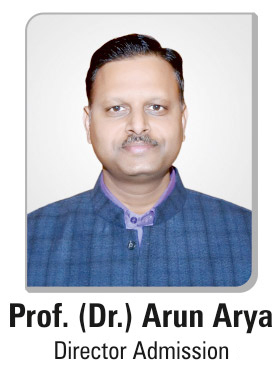 Chairman, Arya College of Engg. & I.T. Er. Anurag Agarwal is committed to train and equip its students with the latest knowledge and skills in the milieu of Technological growth to enable them to face global challenges and help them foresee things with a view to transform the challenges to achievable goals. He inspires them to be insightful, honorable and responsible citizens of this great country. He is ambitious to undertake research and development activities also in a big way leading to creation of new knowledge in the chosen fields. He believes, education is an all round personality development, which makes a competent professional to face any global challenge and leave an impression of perfection in everything we do.